Alright, this episode is kind of a big deal. 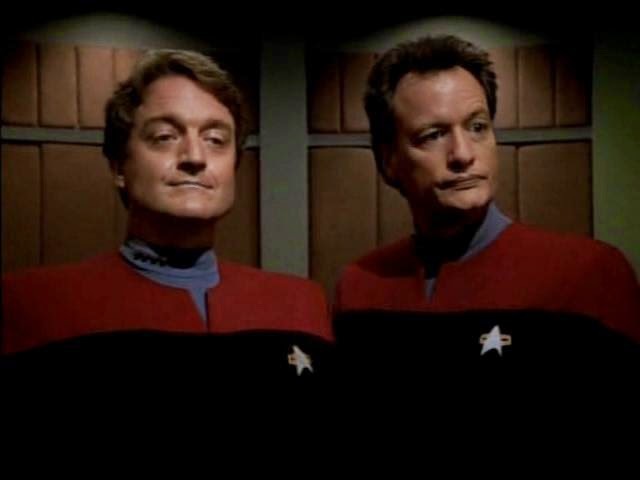 It's the first appearance of Q in Voyager and, in many ways, Q was put to more interesting use here. He was a pest for Picard but he's something more for Janeway. He's a villain, a potential love interest, a combatant, a friend, and, yes, a pest. So here's what happens in Death Wish: Voyager is going about their business and happen upon an imprisoned Q. Not THE Q. Not the one we know. A different Q. For the sake of all our sanity, he's identified as Quinn. And, Quinn wants to die. He's had enough of immortality. He's had enough of the endless expansion of the universe and knowing all the things and whatever. He's done. But Qs aren't supposed to die. They don't stop living. They're immortal beings. So anyway, Quinn has been imprisoned for something like 300 years because he's so extra unhappy with his life as a Q and basically he appeals to Janeway for asylum and she's all, "Yeah ok. Let's have a trial and I'll be the judge in the end." And everyone else is like, "Sure. That seems fair." What's the result of all this immortality/death business? Well, it's kind of a mixed bag--of traditional Trek episode types. Since The Original Series, we've had a few different kinds of episodes. You've got the big adventure, the ethical quandary, the romp. (I feel like when I was actually in my YEAR of Star Trek, I had my finger on this a little better but, you know, time passes) And then you've got some sub categories. One-off romance, ongoing romance, single character focus, family focus, etc etc. But those mostly fit into the bigger themes. I love the big ethical quandary episodes, like City on the Edge of Forever: Ethical Quandry with One-off romance and friendship under theme. I love the romps. Man, I love romps. Like The Naked Time: Big crazy romp with some one-off romance and character under themes. For the most part, an episode decides what it is by the end of the cold open and announces its type/theme to everyone. In Measure of a Man you know it's an ethical quandary episode in the first five minutes and you spend the rest of the episode alternately wringing your hands and crying. In DS9's, Take Me Out To The Holosuite, it's clear from the start that this is an episode about baseball and fun and we're all going to enjoy our Trek friends re-enacting The Sandlot. Deathwish is kind of both. Mostly, it's an ethical quandary. It's designed to make us feel ways about things. Particularly, it's designed to make us feel ways about assisted suicide. When is assisted suicide ok? Is it ever? What if it's a guy who's already lived as much life as anyone would ever ask for? Etc. And then Q (the Q we know) shows up and snaps in Riker, Isaac Newton, and Maury Ginsberg for reasons that are... thin. 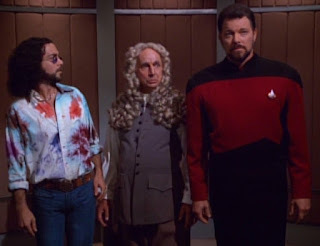 I'm not saying it isn't fun to see Riker. I always like seeing Riker show up but... it's not really justified here. I'm supposed to be feeling ways about things, remember? Not going, "Hey, there's Riker!" It's all really wacky and rompy for about a scene and then it's back to feeling ways about things. THEN, Janeway (who, I'm sure, has had a big day of wrestling with her feelings) wakes up in the middle of the night to find Q in bed beside her trying to get all kissey kissey. He's wearing a night cap. ROMP. Once again, it plays around for about five minutes before Q shows Janeway what she could have if she sides with the Continuum--Earth. They could go home. This is legitimately tragic. The look on Janeway's face is heartbreaking so... we're back to feelings. I think this one has the makings of a truly great episode. We actually get a lot of great stuff about Q and the continuum and about the background of the Q we know. And that's great. We get a legitimately interesting ethical quandary. We get Janeway and Tuvok at their best. And, we get an interesting and satisfying end to the whole thing. I think it's possible that this rompy stuff is in there to keep you from thinking too much about Q and Voyager getting together, to keep us from asking too many questions about why he doesn't just send them back home. Either way, I've always quite liked Death Wish. I just wish it wasn't suffering an identity crisis. I've always liked this one too. The interactions between characters are fun, and the questions the episode raises are intriguing. The dynamic between Q and Janeway is a really enjoyable continuation of what Q learned about humanity through Picard. (And a relief after the lackluster appearance on DS9.) I honestly think Q has "matured", if you can say that about an immortal being. By the time this episode is over, you can see his fire has returned and Janeway had a part in lighting it. 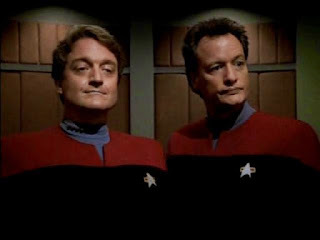 It's too bad that Q only made 3 appearances on Voyager, because he was actually coming into his own evolution, with his own growth, relationships and new-found purpose as a parent. I'm sure Voyager wandering the Delta Quadrant alone, was a curiousity for him. And maybe it's just me, but I think he had actually taken quite a liking to Janeway. He sought her advice! : ) The upcoming "Q and the Grey" episode is a really good continuation of "Death Wish" and I absolutely love Suzie Plakson opposite John de Lancie! That's just brilliant casting.